On May 15 I went to Val-David with G, Awall (& Neil), Pallek and Eric. Two days remained before returning to Europe. Hopes were high to send Crazy Belly but unfortunately it didn't happen. I actually didn't even try it. The conditions were really bad. The temperature was fine but it was actually the humidity that was a factor. Climbing so much in the desert I've been spoiled by the lack of wetness. At Val-David the rock was wet under the roofs and slimy all over most other holds. I couldn't even dead hang some of my regular warm-up holds. It just wasn't the day for it, and I'm fine with that. I am hardly in top condition and therefore it gives me something to train for when I return to Canada. We moved on past that and I remembered "O Couto". I first tried this climb in 2007 or 2008 - my longest project ever. 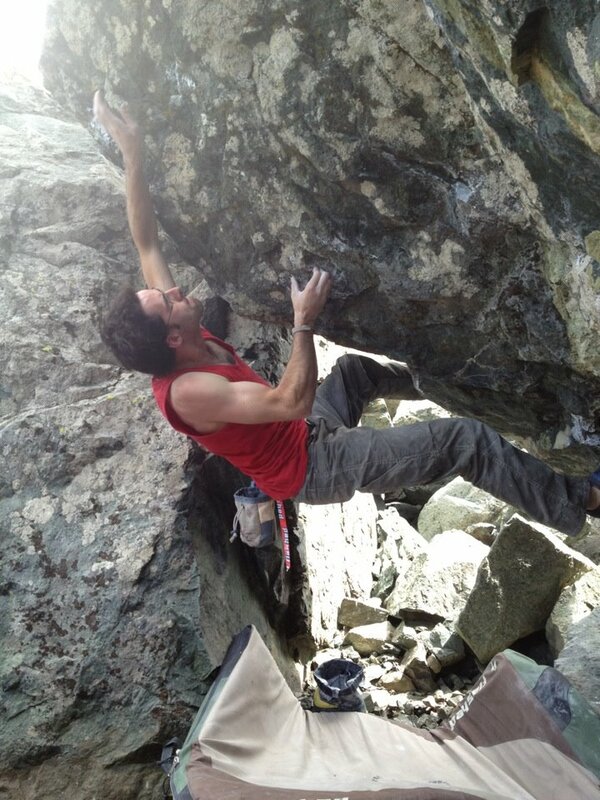 At V10 it was always something I wanted to do, plus it revolves around a really bad left hand crimp which I like. I've never been close to sending it. I can get the crimp but freeing my right hand to move to the top was always really hard. Denis gave me some beta about two years ago, which was to under-flag my right leg once I got the crimp (here's a video of him doing the climb). I had tried that and it had never helped but I stuck with it. This session I can't say I changed anything but something must have been different because it all felt doable. After my first burn I realized that it didn't feel bad like before and then I sent on maybe my 3rd try. It felt like it should have four years ago. I really can't figure out why, but it doesn't matter because it felt sooo good to bump to the top of the boulder and let out a cry of joy to be on top. It feels great to have that chapter all done and over with. I'm getting too old for lifetime projects.